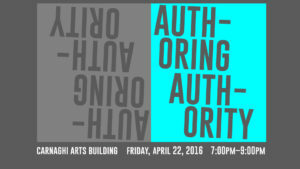 FSU’s Intermedia class presents ‘Authoring Authority’, a collection of works that explore the idea of authority and its active role in our lives. Join us Friday, Aprill 22 at Carnaghi Arts Building from 7-9pm. Exhibition presents works by Sierra Kramer, Drexston Redway, Jeremy Probst, Daniel Rodriguez and Christina Phillips.